Each week students engage in peer study after enjoying a BBQ dinner. Industrious and passionate foodies cook up a storm for Ashkefardic night. It was an absolute feast for the senses: an explosion of Sephardic and Ashkenazic cultures as enjoyed through food, music and ethnic clothing. The program began with a musical Havdallah and included stories by students concerning their family histories. " We need to do this more often, " was the prevailing sentiment. Sixty students participated in the Fall 2012 Jlearn courses which consisted of nine class offerings. A jLearn deli social was enjoyed by participants who could attend; but all enjoyed the food for mind and soul offered by the classes. The Women's Talent Show at Chabad showcased the fabulous talent of our very own women. There was everything: drama, vocals, music, dance, poetry, art and photography. One act was better than the next, the desserts were luscious and the ambiance was simply Divine! Chabad students manned kiosks in each dining hall, in the lecture hall and in the library at which free Chanukah kits were distributed so no Jew at BU will be left behind. It's lights across Binghamton this Chanukah! Students of CIW enjoied a pre-Chanukah party for their housing community. Chabad and the administration of Twin River Commons held a Chanukah Party for students on the West Side. The Best Things are Small! Chabad held intimate Chanukah celebrations in off campus apartments and Frat / Sorority houses all around town. Hundreds of students packed the Mandela Room to celebrate Chanukah in an event that marked the culmination of a two months long " Light up a Life" toy drive which garnered toys worth over $10,000 that will be distributed to children with cancer through Chai Lifeline.The event featured a menorah lighting ceremony, a performance by the Binghamton Crosbys and a mass Dreidel Spin Off. The energy in the room was electric and everyone had a ball but the world record was not broken due to 40 dreidels falling short of the requisite 10 second spin time. Dreidels, Latkes and other treats rounded out the huge celebration. Chabad students visited the elderly in facilities around Broome County bringing them Holiday cheer and treats. Man oh man, those latkes the guys made were delicious! Avi Liberman '03 came home to spend Shabbat at Chabad on Chanukah. He spoke on Friday night about negotiating the "Hollywood scene" as an observant Jewish comedian. At his Saturday night show he had the crowd in stitches. Participants on Birthright Mayanot Bus #438 led by Rabbi Chein did not let the inclement weather dampen their spirit. They used words like " amazing", "unforgettable", " fun", and "inspiring" to describe their ten day trip in Israel. 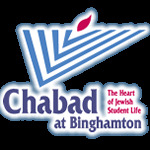 Hundreds of students enjoyed a new Binghamton Chabad tradition: the Spring Welcome Back Sushi/Soup/ Salad event. The food was great, as was the chance to see "everyone" again! Downtown students enjoyed a taste of Israel at the welcome-back event at Chabad Downtown. At the first Challah Baking for the Spring semester, 40 students enjoyed mixing, shaping and baking their own bread. "This event is always " a rising success!" said participants. 40 students enjoyed a picture perfect ski trip at Greek Peak. GNO: Playing on the Clayground! The Girls Night Out program for the month of Adar featured the decoration of personal clay bowls that then went for firing in a pottery kiln. Binghamton students gathered for the weekly Supper and Study program joined world Jewry in marking the completion of the 32nd cycle of Study of Maimonides's Mishne Torah and beginning the 33rd cycle of study. Mazel Tov!